The way a beer looks has a powerful impact on its enjoyment. The color of a beer is an important visual cue and part of the overall sensory appeal of evaluating a brew. 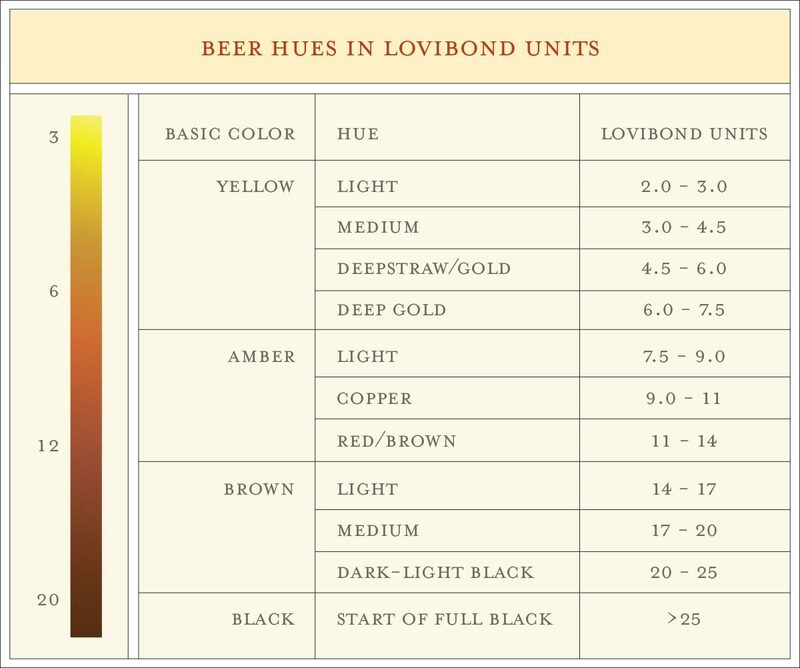 Brewers carefully control the color of their beers and define the colors on the Lovibond scale. The higher the number, the darker the color of the beer. Abita Wheat is a three and Turbodog is a 60 on the Lovibond scale. Classic beer styles are defined in part by definite visual images of what is appropriate. Larger breweries use a special device called a spectrophotometer to measure the exact Lovibond units. If you don’t have your own personal spectrophotometer, you can simply compare the tall, cold glass of beer you’re holding to the chart. Beer is also rated in units of bitterness called International Bitterness Units or IBUs. IBUs measure the intensity of the bitterness of the beer. Bitterness in beer comes from a compound in hops called alpha acids. Different varieties of hops have different ranges of alpha acids. Brewers use different varieties of hops to create different levels of bitterness. 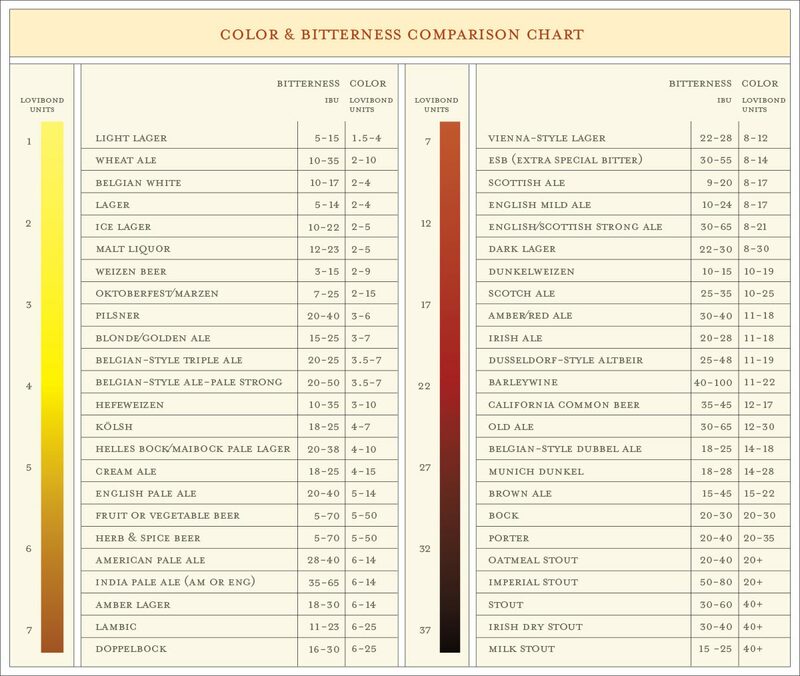 The chart below is often used in beer tasting competitions and displays the range in color and the range in bitterness for many different beer varieties. When people who enjoy beer talk about their favorites, you’ll hear some of the same words over and over. Terms like mouthfeel, aromatic, grassy or hoppy have become part of the standard language of beer. 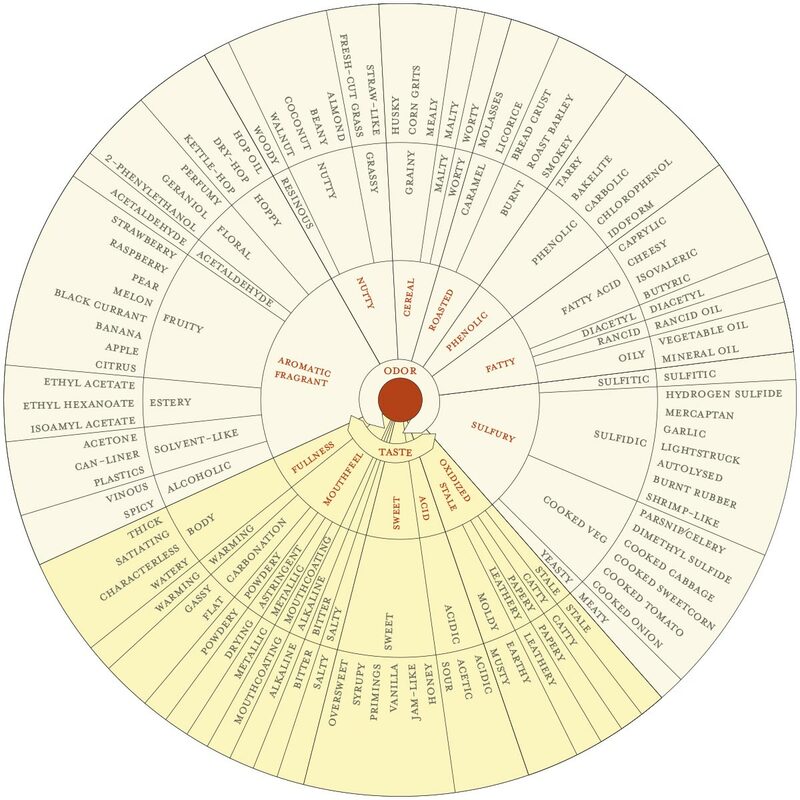 In the 1970s, Dr. Morten Meilgaard created the Beer Flavor Wheel. The wheel has 14 categories broken down into 44 flavors. The wheel was a way to standardize a language through which beer tasters can agree on a word-to-flavor correlation. Scientists have found more than 1,000 identifiable flavors in beer, yet an experienced taster can pick out perhaps only 100. Dr. Meilgaard’s wheel gave beer tasters a common vocabulary and caught on all over the world. It is now used as the standard reference by the European Brewery Convention, the American Society of Brewing Chemists, and the Master Brewers Association of the Americas.